Some of the major companies in vegetarian capsules market comprise Bright Pharma Caps, Inc., ACG Worldwide, Capsugel, CapsCanada, Qualicaps LLC, Healthcaps India Ltd., Sunil Healthcare Limited, and Suheung Co., Ltd. New manufacturing units for vegetarian capsules in economically stable nations and Investments in R&D along with collaborations & acquisitions with producers in different areas are major differentiating plans of the leading market players in vegetarian capsules market. For example in April 2016 in India, the CDSCO (Central Drugs Standard Control Organisation) made a decision over a proposal to shift to vegetarian capsules, restoring the animal-based & widely-employed gelatin capsules. According to the experts at Zion Market Research, global vegetarian capsules market was capitalized at almost USD 278.16 Million in 2016 and is likely to create an income of almost USD 509.13 Million by end of 2022, developing at a CAGR of almost 10.6% from 2017 to 2022. Global vegetarian capsules market is majorly boosted owing to factors such as these capsules are believed as a convenient technique of eating medication and health supplements. In addition to this, users in developing areas now have higher spending capacity and the capability of allocating more funds towards preventative healthcare, boosting the vegetarian capsules market. Also apart from the nutraceutical and pharmaceutical industries, the requirement for the encapsulated material is on the rise in the cosmeceutical industry. These end-user drifts will have a far-reaching effect on the development of the global vegetarian capsules market. Moreover, in mass areas such as India, where the bulk of vegetarian users view animal-based gelatin in a negative light, firms face the requirement to find solutions around the issue by aiming more on non-gelatin derived capsules. In general, all over the world, the requirement for vegetarian capsules is displaying a clear rise in demand, and companies are suggested to explore development avenues in vegetarian capsules market. Europe, North America, Latin America, Asia Pacific, and Middle East & Africa are major regional divisions of global vegetarian capsules market. North America is expected to stay the leading area in vegetarian capsules market in the years to come. 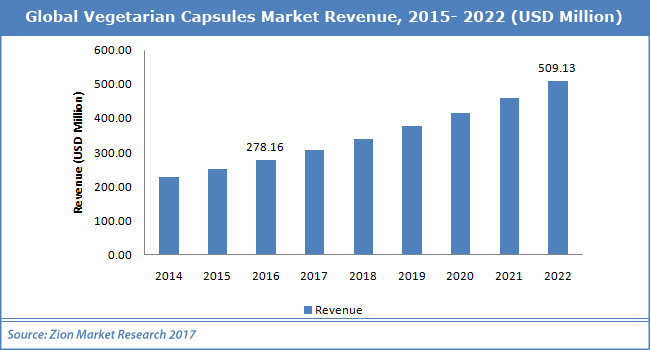 The vegetarian capsules market in the U.S. is likely to develop at the uppermost CAGR majorly owing to noteworthy investments in R&D for efficient treatment options and immense per capita health expenditures. The Asia Pacific is likely to be the quickest developing area in vegetarian capsules market in the years to come in the vegetarian capsules market. In addition to this, the Middle East & Africa and Latin America are likely to experience reasonable development in vegetarian capsules market within the forecast period.